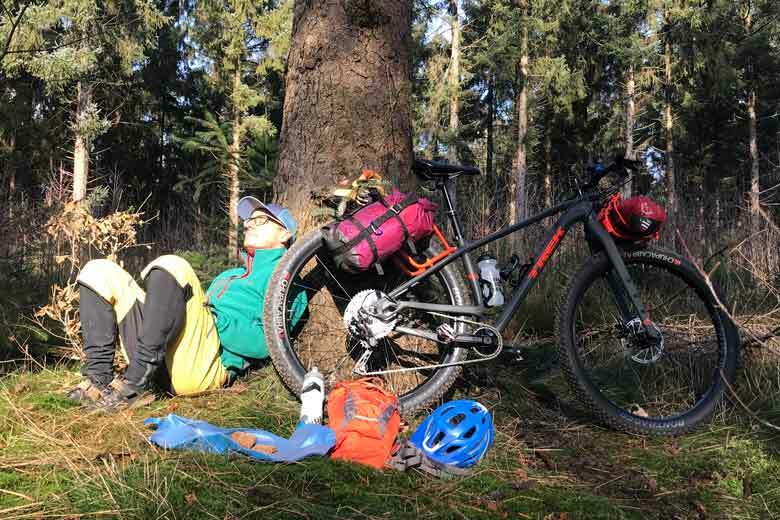 The Trek 1120 is a bikepacker that comes off the shelve complete with racks so you can start your first bikepacking adventure almost overnight. But is it any good? Read the review and watch the video! This story basically starts around 35 years ago. I was in my early teens and I had a second hand Raleigh Maverick mountainbike that I converted into a trekkingbike for ruff roads. I didn’t know it then, but that was my first Bikepacker. In the Trek 1120 I see that same bike only wayyyyy better. 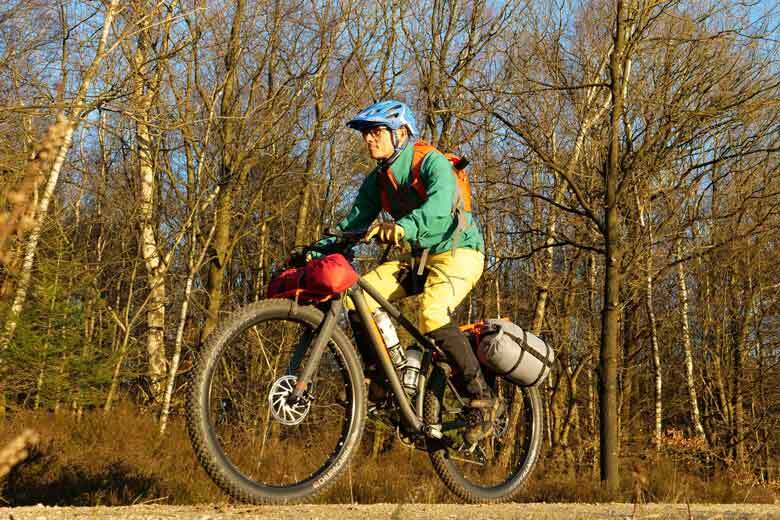 The Trek 1120 Bikepacker is part of the Trek Adventure Family that consists of the 520 – a classic touring bike with a steel frame -, the 920 – a more gravel orientated touring bike with an aluminum frame – and the 1120 Bikepacker, the Hummer of the family. Expect a review on the Trek 520 later this year! The riding position is sort of sportive due to the low and curve handlebar. The total weight of the Trek 1120 is 14,17 kg according to Trek. I measured my testbike – size 17,5 – at 15,34 kg including pedals, racks and cargowebbing. The weight is fine for this kind of a bike. Trek doesn’t provide the weight of the frame, but I am curious to know. The heart of the Trek 1120 is an aluminum frame – Alpha Platinium Aluminum – with a very sloped top tube. Those of you who know the Trek brand might see the resemblance with the Trek Stache. And that is in fact the inspiration for the 1120. The rear end of the frame is quite special. The chain stay on the right side – where the chain is situated – is above the chain itself while on the left side the chain stay is at its normal low position. The construction on the right side is officially called a mid stay and deals with the problem on fitting large 29” tires and not making the wheelbase longer than necessary. Explanation in the video! 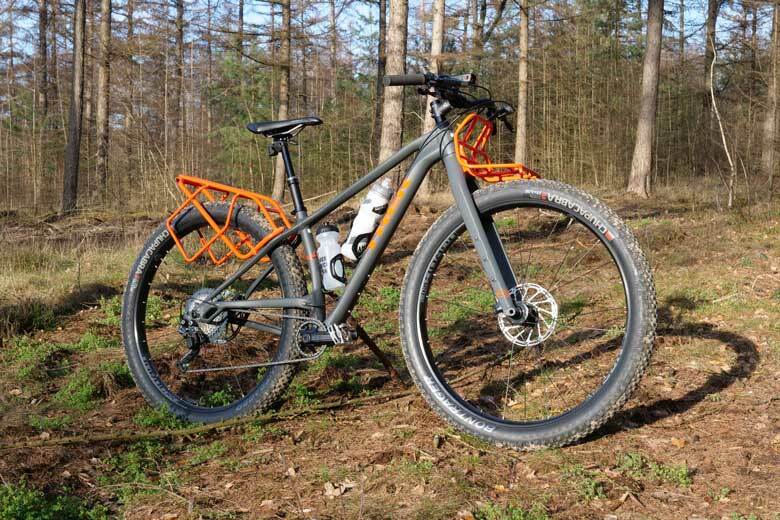 For a bike that should handle nimble you don’t want a too long wheelbase. That said: if you compare the chainstay length of the 1120 to the one of the Stache the 1120 is a bit longer enhancing the climbing capabilities of the 1120. At the rear you find a 148 mm BOOST hub with a 15 mm axel. The Trek 1120 is a bikepacker that comes off the shelve complete with racks so you can start your first bikepacking adventure almost overnight. Talking on chain stay length: the dropouts on the rear are adjustable in the horizontal direction. Thanks to these so-called ‘Stranglehold dropouts’ one can easily adjust the wheelbase over a length of 15 mm from 525 mm-540 mm to the circumstances or your riding style. 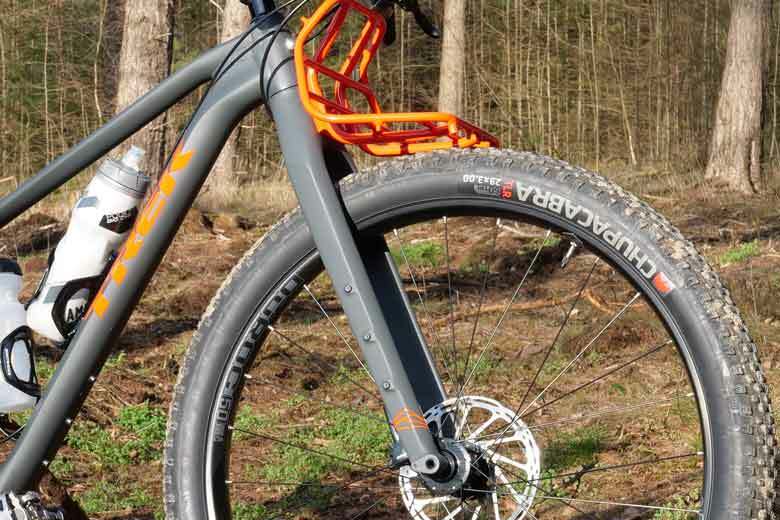 On more demanding fast turning curvy tracks you might want a more nimble bike – so a shorter wheel base – and on a longer less curve distances you might prefer the a more stable ride, so a longer wheel base. The Trek 1120 has dropouts that can adjusted to play with the wheelbase over a length of 15 mm. 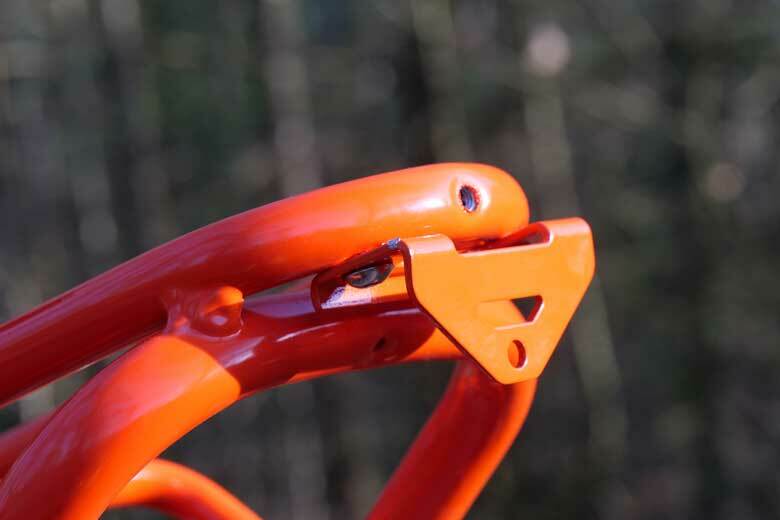 The frame has three points to store bottle holders: one in the seatpost, one on the inside of the downtube and one on the outside of the downtube. I used only the two inside the frame but if you use a triangular bag in the frame you need the lower outside one. On the outside downtube you can fit a large 1.5 bottle holder. 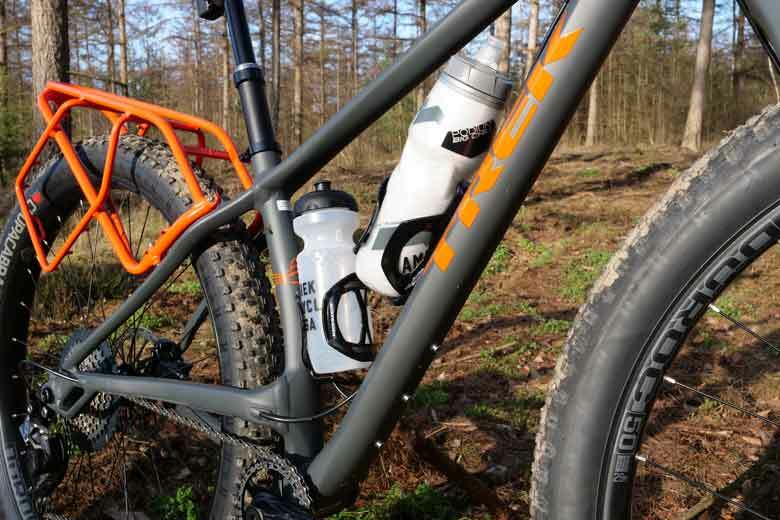 The Trek 1120 has plenty of space foor bottle-cages. The fork of the Trek 1120 is made of carbon but the alloy steerer tube bonded in to it. Totally carbon would not be possible off course. The fork itself is a thing of beauty. On the crown four holes with integrated nuts hold the front rack. 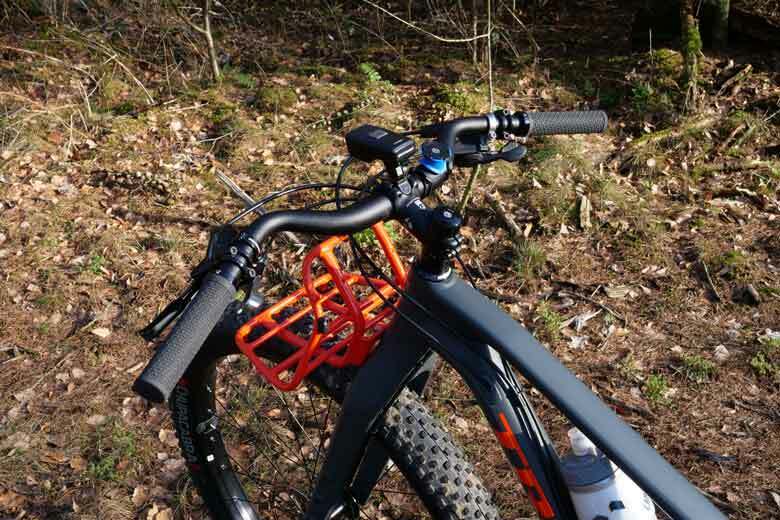 On the lower end of the fork three holes with integrated nuts on both sides give you the possibility to attach low rider racks or bottle-holders to expend the carrying possibilities of the 1120. 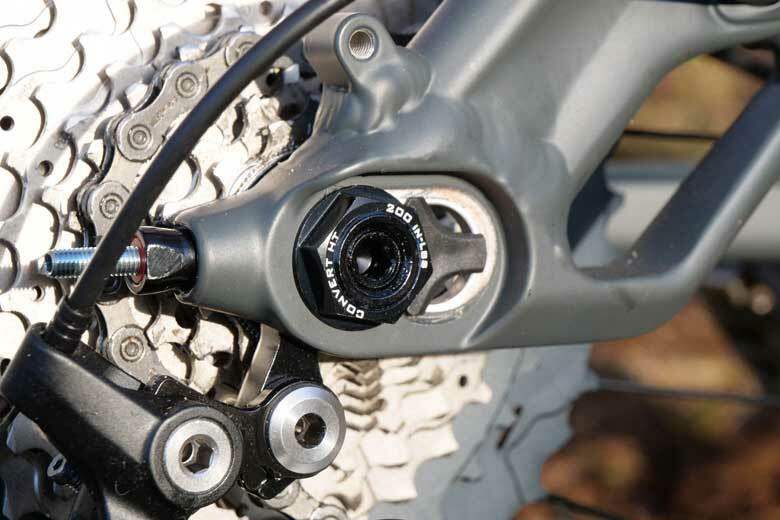 Like most Trek mountainbikes the fork has the 110 mm BOOST spacing to fit the 110 mm BOOST hubs. The axel is a 15 mm thick one to provide loads of stability while braking. 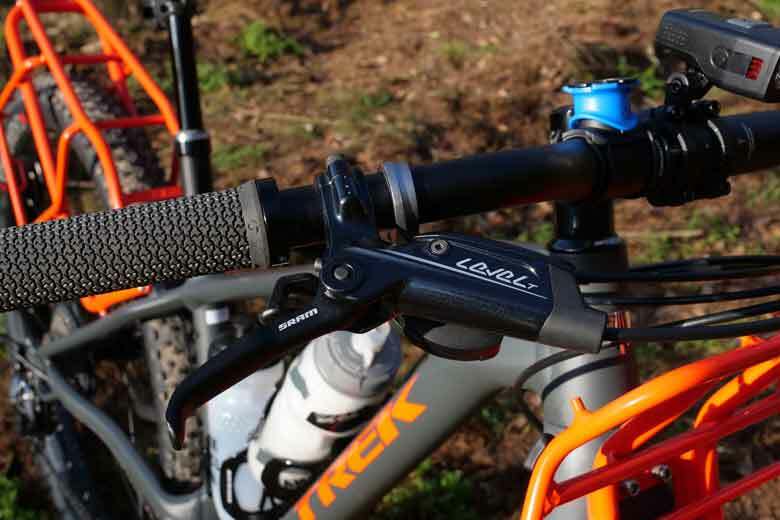 The fork on the Trek 1120 is made out of aluminum. As mentioned above the front rack is mounted directly to the forks crown with four hex bolts. It is quite easy to attach or detach so you can use the Trek 1120 also as a mountainbike. The rack I weighted at 442,2 grams on my precise scale. 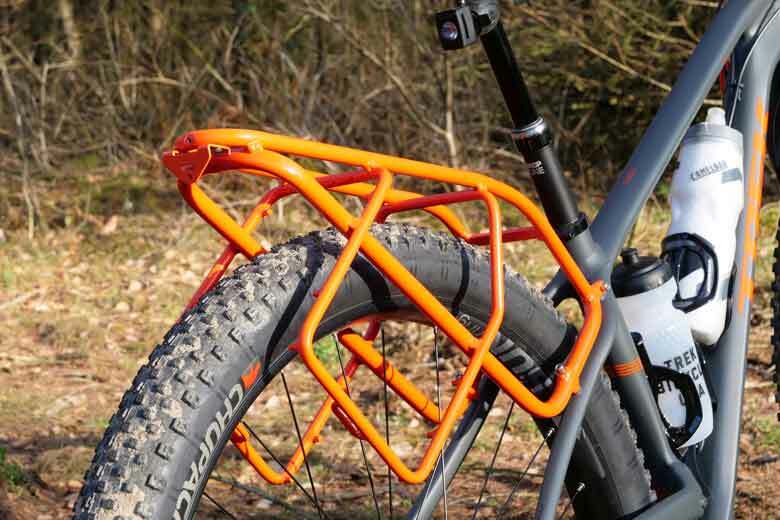 The load capacity of the rack is 7 kilograms and that is enough weight to put on the front end of a bike that high. With low riders on touring bikes I normally go to the max of 10 kg in total and that is possible because it keeps the center of gravity quite low. With the high mounted rack on the Trek 1120 the center of gravity is not ideal so less weight is better. The front rack’s shape is like an excavator: super! I put a lightweight MSR Freelight 1 tent (1130 grams) on it together with some small stuff I need on the go. Super is the shape of the rack: it’s a sort of shovel shape you find on large road construction trucks and it wraps around the luggage. Next to that the rack has many pints you can attach or hook cargo-webbing around. Or just to twee simple velcro straps like I did. The fact that the rack is connected to the fork and not to the head tube has its benefits: the rack moves in the direction you steer and I found that a very logical thing. Also if you turn the track in front of the bike is more visible. I once tested a Bikepacker with the rack mounted to the head tube and I found corning a very weird experience. For the rack in the rear a lot is similar to the one in the front. It is attached to the frame on four points with four hex bolts. This makes the rack one solid extension to the frame and 12 kg of cargo is allowed. This is good for the balance especially on fast curvy downhill tracks. The rack is easy to detach and weighs 701 grams (1188,7 with webbing). The rack is shaped nicely around the rear wheel and has a fixture to bolt a light or a reflector to. 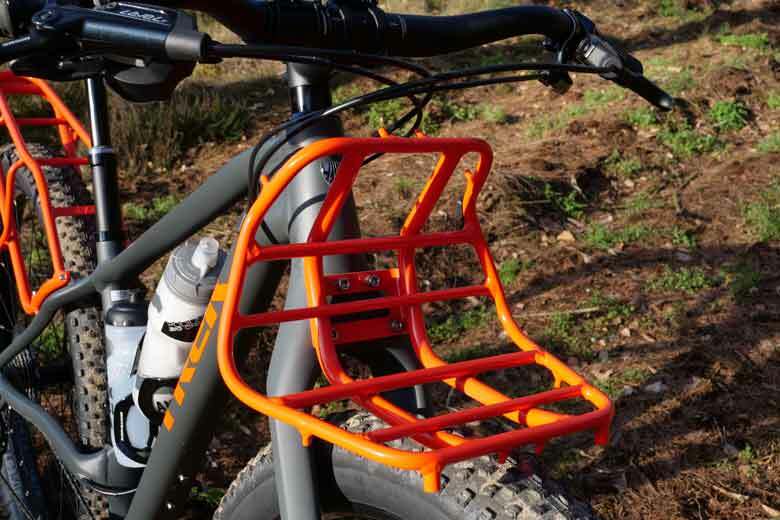 The rear rack is one solid extension to the frame and 12 kg of cargo is allowed. The rear rack has a mount for a taillight. The Trek 1120 is a fine touring companion and dreaming of future adventures is part of the fun. 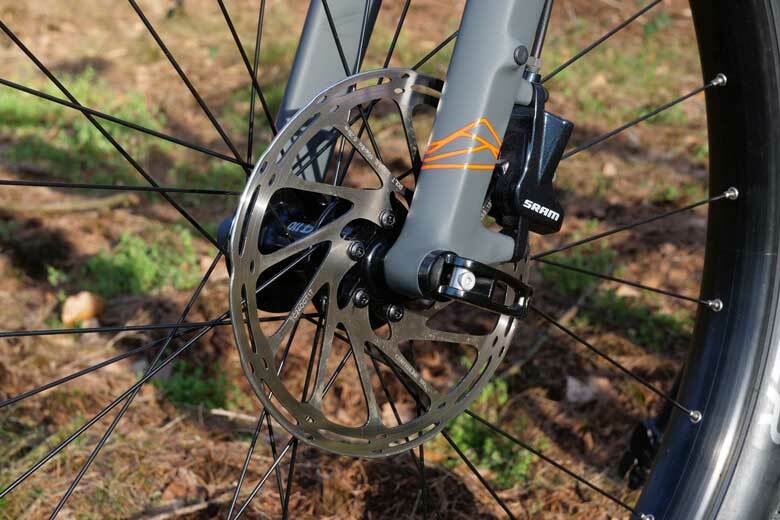 The brakes on the Trek 1120 are SRAM Level T hydraulic disc brakes. The front and rear feature a 180 mm disk. Both calibers have two pistons. 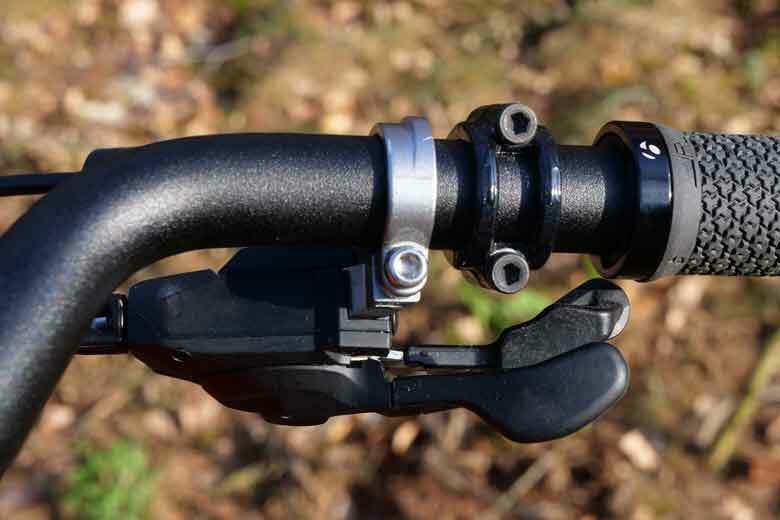 The brake levers are short so they don’t get stuck behind branches and aren’t easily damaged in the occasional tumble. On the levers you find a small hex screw to adjust to position of the lever to smaller or bigger hands. 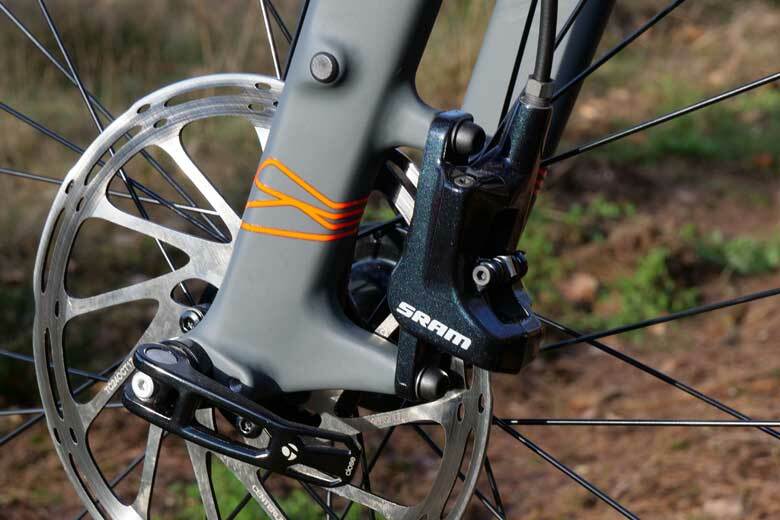 Although the SRAM Level T brake sets are not the newest on the market and basically a budget level set, they do well on the 1120. Brake power is more than sufficient and you don’t need a lot of strength in the fingers to come to fast full stop. Not even fully loaded. The front and the rear discs measure 180 mm. The brake calipers are operated with two pistons. The brakes perform well: the dosage is fine and very well balanced. On the brakelevers you find a small hex screw to adjust to position of the lever to smaller or bigger hands. Totally in line with the ongoing trend on fitting cross country mountainbikes with a 1 x 11 set gearset, Trek does the same with the 1120. The front features a 30 teeth sprocket and on the rear Trek mounted an 11-46 cassette. 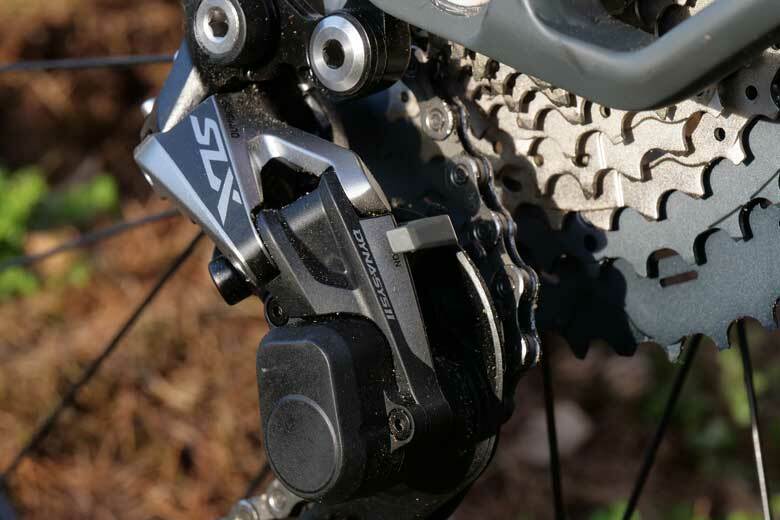 Al drivetrain gear parts are Shimano: SLX M7000 shifters en rear derailleur. The later is equipped with Shadow Plus technique. 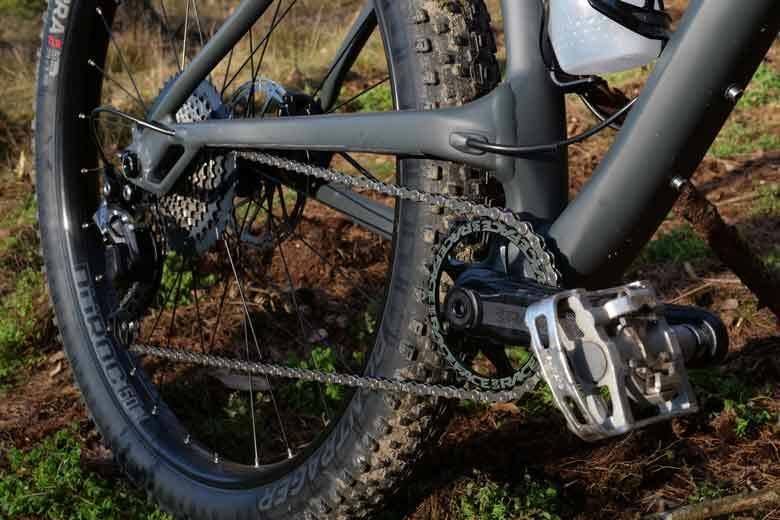 With Shadow Plus you can fix the derailleur so that is doesn’t hop around when riding over a bumpy terrain resulting in a smoother ride with less change of derailing the chain. It also prevents the ‘klettering’ noise when the chain hits the chain stay and the scratching the chain stay as an extra. The Shimano SLX is also a bit of an entry level set but it works fine. Shifting upwards is possible one-by-one or three sprockets in one go. Shifting down go’s one-by-one like pulling the trigger on a gun. The Shimano SLX system never failed me and I rather have this than the more expensive sets. 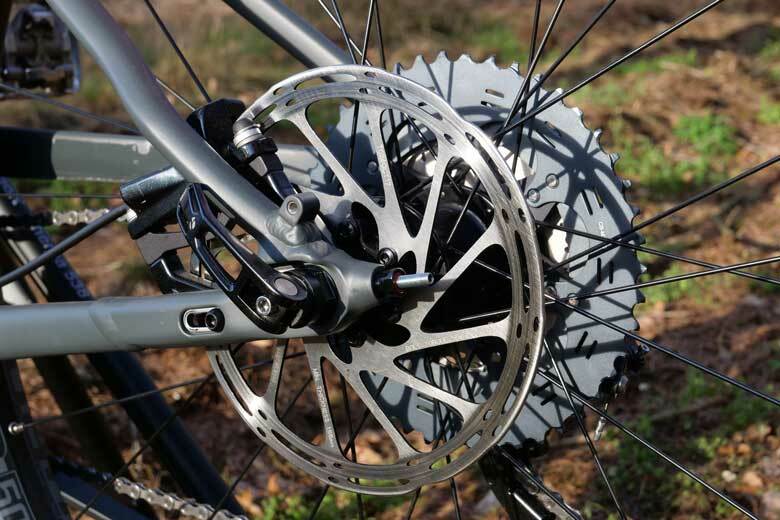 The 11-speed drivetrain on the Trek 1120 is mainly from Shimano. 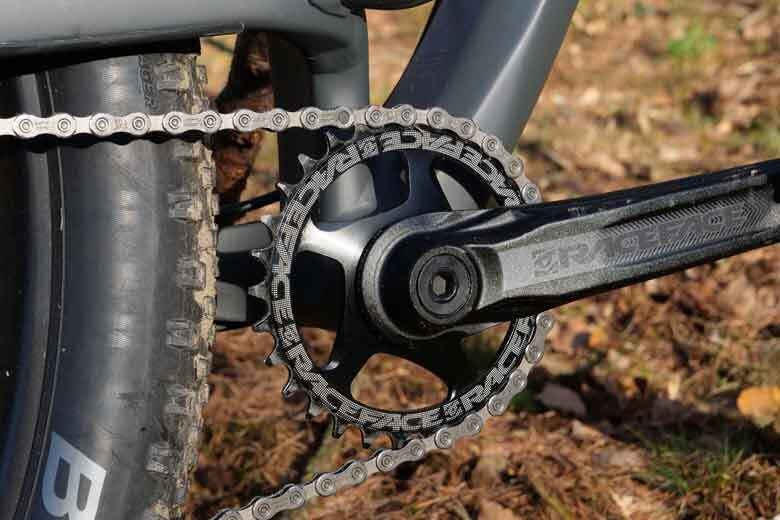 The crank and the 30T sprocket is from RaceFace. The Shimano SLX M7000 shifters are fast and accurate. 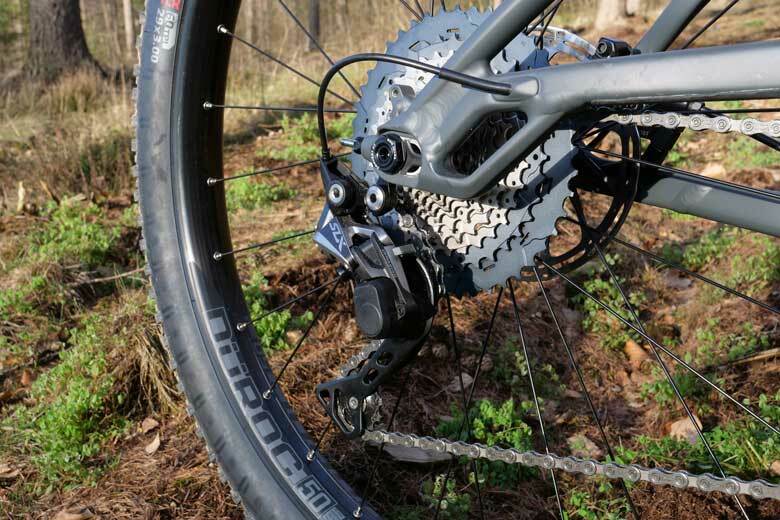 Trek mounted an 11-46 cassette that gives a wide range and is capabel from flat terrain to mountains. The rear derailleur is equipped with Shadow Plus technique. Trek uses of course a lot of Bontrager components on the Trek 1120. 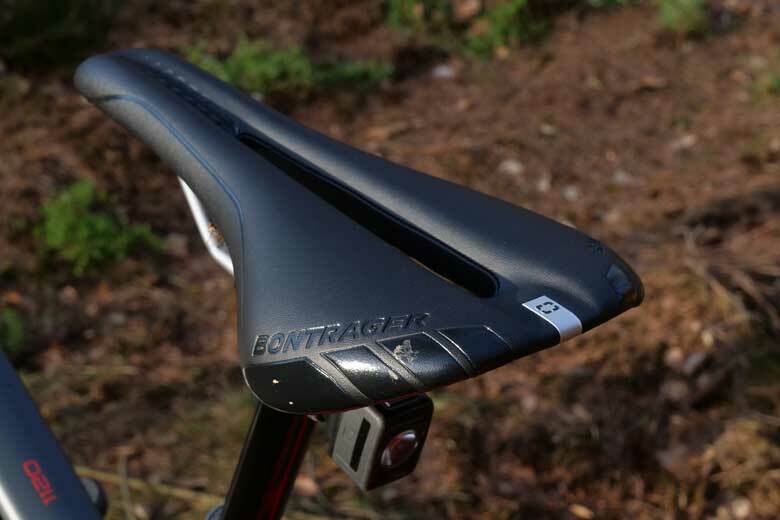 For those who don’t know: Bontrager is Treks own component brand. The Bontrager parts are the 110 en 148 BOOST hubs, the Montrose Comp saddle, the Drop Line 125 drop seatpost, the Crivitz handlebar, the Race Lite grips and the Elite stem. The Chupacabra 29 x 3.00” tires are also from Bontrager but the rims are from SUNringlé: Duroc 50 SL with 28 spokes. For so far the technical part, now lets ride! The saddle on the Trek 1120 is a hard one and not comfy enough for touring. I have been testing the bike on- and off road. During long flat hauls with headwind guaranteed and nice twisty, bumpy single trails in the forest. I consider the Trek 1120 to be a hybrid: a mix between an old-fashioned mountainbike (with modern state of art geometry) without suspension and a touring bike. The big tires absorb a lot and compensate the very stiff fork. The performance is overall fine. The bike handles well. I did ride it with the rear wheel in the front dropout position and in the rear position. If you like tight cornering than the front position is better, but I liked the bit more relaxed ‘long wheelbase’ position generally more. Since I changed to that position I don’t feel the urge to change it back again. The dropper seat post with the remote on the handle bar worked fine and I like dropper posts a lot because of their purpose on steep trails, but also to change the riding position on long distance travels. The Bontrager tires with their small profile are generally fine. Grippy in sand and mud, fine on tarmac or other hard surfaces. 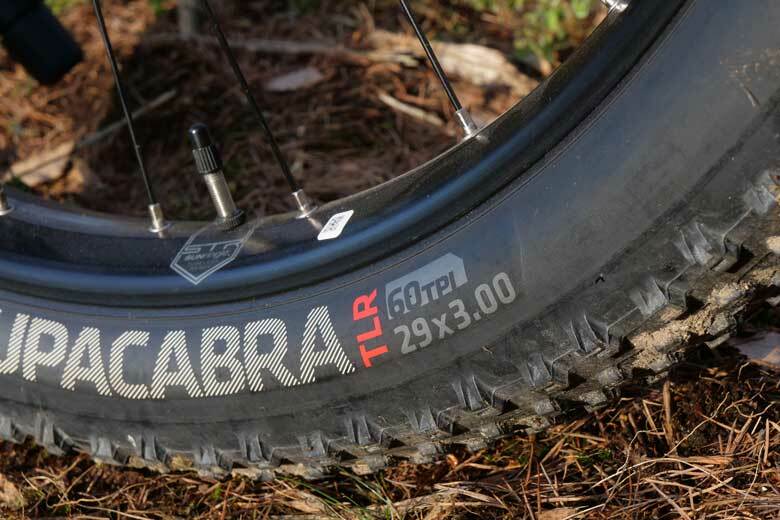 They are tubeless-ready which saves weight but on touring bikes I’d use tubes. The brakes performed well. They are easy to adjust and they don’t need much force to apply maximum stopping power. Also on loose surfaces they are quite forgiving. The same for the Shimano shifters and derailleur: easy to use, accurate and no miss shifting here. 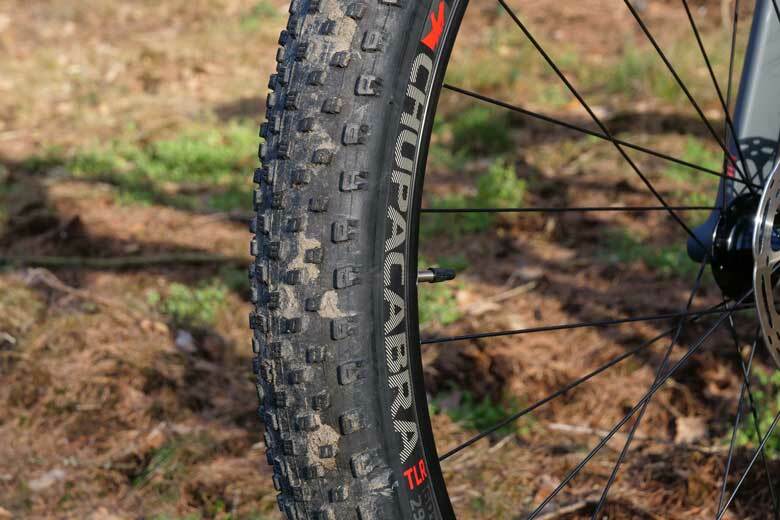 The Bontrager Chupacabra tires with their small profile are generally fine. The Chupacabra 29 x 3.00” tires are super wide! The racks are an example to other manufacturers: this is how it should be done if you build a Bikepacker. The racks are solid, they are one with bike and the load capacity is enough for the ‘minimalistic’ Bikepacker approach. I do like the multi-functional harnesses! As a mentioned before: I did ride the bike on longer straight distances and on twisty trails. And now I have to write something about ridecomfort. If you intend to use the Trek 1120 as a Mountain Bike Bikepacker for shorter ‘weekend’ trips, than I don’t have much to beef about. Those kinds of rides are mostly very dynamic with not to much time in saddle. If you use it as a Touring Bike Bikepacker… I do have some issues. On longer hauls the position on the bike is sort of comfortable. I noticed that the position on the bike is quite sportive. Due to the special shape of the handlebar there is quite some weight on the wrists and with this handlebar there is not a lot you can do about this. I found the downward twist of the handlebar just a little bit off. The same for The riding position is sort of sportive due to the low and curve handlebar. Saddle and handlebar are very personal choices so let me know if you feel different. In the coming weeks I will try some different handlebar and saddle configurations and keep you posted on this development. The handlebar is 720 mm wide but I don’t like the downwards curve. A last little remark is the front end of the Trek 1120. The frame is stiff and I like it. The carbon fork is a bit to stiff to my liking. If you ride a lot on smoother roads it is not a problem although with the tires well inflated you feel almost every small bump. On bumpy trails you need to pay attention to the pressure in the tires. Too hard: the ride will be uncomfortable and the front will bounce a lot; too soft, no bouncing but it takes a lot of energy. So carefully tuning and experimenting is advised. One final thing: be aware that the Trek 1120 is rated for 136 kilograms in total. So rider, cargo and bike! In the months that I’ve testing the Trek 1120 I’ve enjoyed it a lot and riding is generally a pleasure. As a Bikepacker it is capable of carrying a good load and the racks are top notch. I also liked the easy effective storage harnesses. The hydraulic operated disc brakes are fine and shifting through gears is precise. The position on the bike is quite sporty. The shape of the handle bar is not to my liking as is the very hard saddle. The big beefie tires give a lot of comfort if ridden with the right tire pressure in relation to the road/track circumstances. Especially the carbon fork is demanding a good deal of pressure tuning: bring a pump! 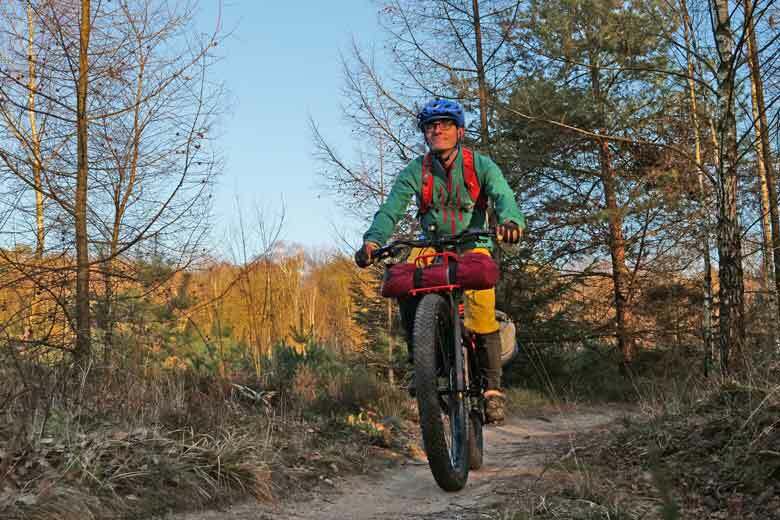 Overall the Trek 1120 is solid Bikepacker that is capable of off-road adventures to long distance traveling. The price of € 2699 or $ 2649,99 is decent. I rate the the Trek 1120 Bikepacker at 9.0/10 points.